To this day, fans are still asking BioWare and Electronic Arts for a proper sequel to Star Wars: Knights of the Old Republic (KOTOR). All the pieces are there: Electronic Arts has the sole license to create Star Wars games, and BioWare was the studio behind the first game. Instead, fans have to contend with the first two entries in the franchise or the massively-multiplayer Star Wars: The Old Republic. Star Wars: Knights of the Old Republic is a turning point for Western-developed role-playing games on consoles. Before that, console RPGs largely came from Japan, with franchises like Final Fantasy, Dragon Quest, Wild Arms, and Tales Of leading the pack. Western RPGs were thriving, but they were doing so on Windows PCs. For those who only played on consoles, titles like Ultima, Baldur's Gate, Elder Scrolls, and Fallout simply didn't exist. That was until Microsoft decided to enter the console market with the original Xbox. As part of Microsoft's push to differentiate its first home console, the company reached out to many PC developers, asking them to bring their best work over to the Xbox. Bethesda offered the opening salvo with The Elder Scrolls III: Morrowind, a title designed for Windows PCs and Microsoft's console. Nintendo 64 and Sega Dreamcast players had never seen anything like Morrowind and it was an instant hit. The original Xbox also gave PC developers something they were missing before, a single hardware specification to develop for. Bethesda pushed its RPGs forward with Morrowind, a 3D experience with vast cities and wilderness to explore, backed by a presentation that used beautiful graphics and voice acting. A number of computer RPGs prior to Morrowind were 2D isometric affairs that relied on extensive written dialog; many were based on older pen-and-paper RPGs. Star Wars: Knights of the Old Republic saw BioWare hit the big time. For me, it was my first entry in the world of CRPGs and I'm sure that's true of many others. Knights of the Old Republic made BioWare into a household name by adding a blockbuster spin on the studio's formula up to that point. While previous BioWare Infinity Engine games had companions who could join your quest, Knights of the Old Republic featured a smaller, but more consistent and memorable cast. I ran around the galaxy with Bastila Shan and Juhani, meting out Jedi justice wherever it was needed. The crew of the Ebon Hawk stretched from the wisecracking Twilek Mission Vao, to the hilarious misanthropic droid HK-47, or to Jolee Bindo, a former Jedi who ran from the Order. BioWare tried to make every character a Minsc; it didn't completely work, as KOTOR had some bland characters like Bastila, but the studio's efforts were worthwhile. BioWare went all-in with full voice acting, adding more personality to the cast. Many of BioWare's earlier games-which were based on Dungeons & Dragons' (D&D) Forgotten Realms setting-made room for multiplayer, assuming you'd potentially end up in a party with your friends. KOTOR was a wholly single-player adventure. The setting was genius. 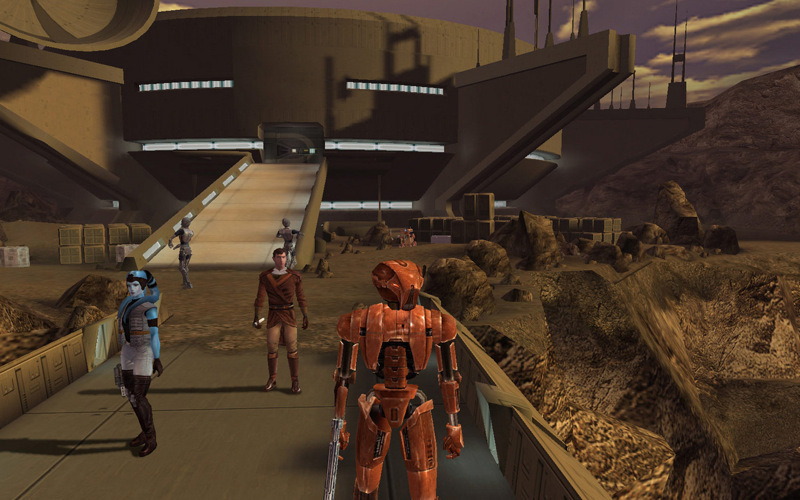 BioWare had the option to place its game around Star Wars: Episode II – Attack of the Clones, or 4,000 years earlier during the height of the Old Republic. The studio chose the latter, which allow them room to play around in the Star Wars universe. One planet was a familiar mainstay in the universe, Tatooine, but otherwise BioWare had the freedom to define planets that were all-new or briefly mentioned in previous Star Wars lore, including Taris, Kashyyyk, and Korriban. 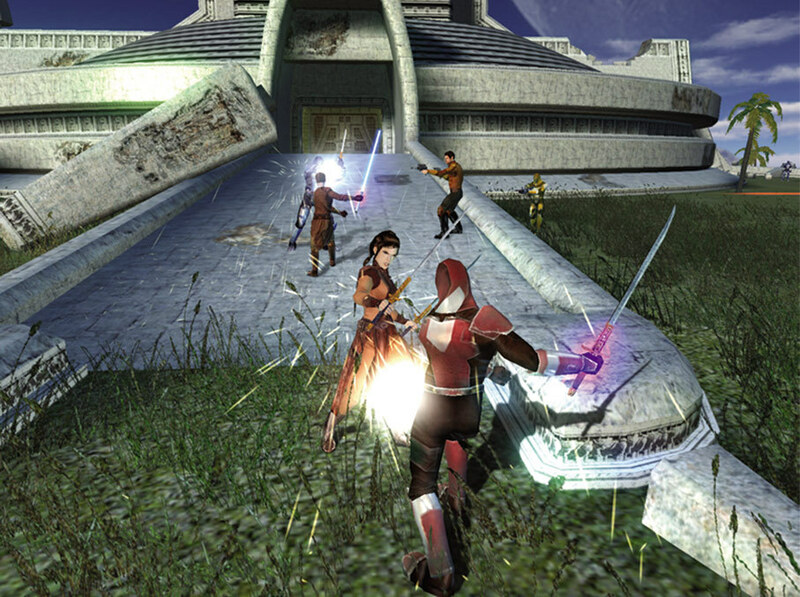 Knights of the Old Republic also established the fairly rigid good-evil morality system that BioWare would continue to use in future games like Mass Effect. The difference in KOTOR is the line between good and evil is more clearly defined by The Force. Star Wars' mystical pool of energy has always been based on the Light and Dark Sides, allowing the fiction to back up the mechanics. BioWare also brought to Star Wars gaming something that had previously been absent: character creation. Prior to Knights of the Old Republic, you played an existing film character like Luke Skywalker, Han Solo, and Leia Organa, or a new character created solely for the game, like Kyle Katarn (Star Wars: Dark Forces) or Dash Rendar (Star Wars: Shadows of the Empire). KOTOR allowed you to create your own character; the choices in terms of character creation were limited, but the final product was your own. You determined whether your character was male or female, whether you were a Force-less soldier or dual-wielding Jedi. The player decided whether they were a heroic do-gooder or the next (first?) Darth Vader. Did you help the children of the space Hatfields and McCoys stay together, or convince both families to kill one another? Do you poison the creation of kolto, the healing liquid most of the galaxy uses, or appease the creature who's behind the miracle drug? Hell, you could convince one of your party members, the wookie Zaalbar, to outright kill his best friend using Force Persuade. Knights of the Old Republic took the structure that BioWare had somewhat established in games like Baldur's Gate and Neverwinter Nights and streamlined it for a mainstream audience. 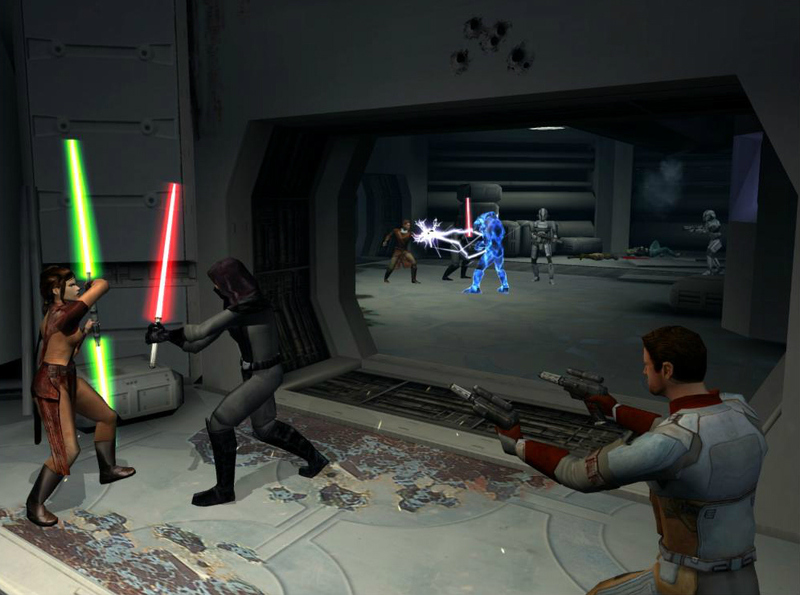 Married to the best-selling Star Wars universe, KOTOR was a hit on the original Xbox. It was a perfect moment in gaming history: the right combination of developer, mechanics, and property. And together with Morrowind, Knights of the Old Republic was responsible for bringing new players into the genre and shifting the face of RPGs for years to come. Star Wars: Knights of Old Republic still stands up, even today. The graphics are dated, but the game remains an excellent RPG, one that Electronic Arts and BioWare really should follow up. Especially in a market where single-players RPGs like The Witcher 3 and Assassin's Creed Odyssey are making money. Until that happens though, we'll continue to celebrate Star Wars: Knights of Old Republic as one of the Top 25 RPGs of All-Time. Tagged with Bioware,	Feature,	PC,	Retro,	Role Playing Games,	Top 25 RPGs.